When her husband passed away after a long, trying illness, Annie Dodds was forced to sell almost everything to settle his estate. Homeless, with little money, she wondered if it might be time to pursue a decades-old dream of living a quiet, self-sufficient life alone, off-grid. One day, when her son told her he knew of an old house on fifty acres, she knew it was time. When her husband passed away after a long, trying illness, Annie Dodds was forced to sell almost everything to settle his estate. Homeless, with little money, she wondered if it might be time to pursue a decades-old dream of living a quiet, self-sufficient life alone, off-grid. One day, when her son told her he knew of an old house on fifty acres, she knew it was time. Feeling empowered and prepared by having read so much over the years, she loaded her belongings into the back of her pickup truck. 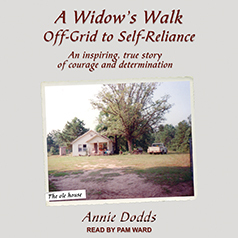 But as she pulled into the driveway that first day, she could not imagine the challenges she would face, the obstacles she would overcome, the self-doubts she would master, and the soul-strengthening peace and contentment she would find living in a rundown old home on fifty acres of country heaven.